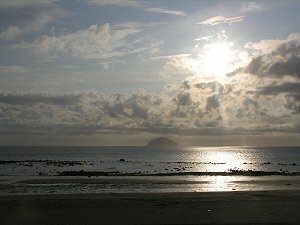 On August 8th 2009 a group of people gathered on the key side at Girvan to await the arrival of "The Glorious", to take them to Ailsa Craig. The weather at the meeting time turned to rain unfortunately, and the mood became less enthusiastic. However the unpredictable Scottish weather cleared to become a truly "Glorious" day. Hundreds of photographs were taken, so not all will be reproduced here. CLICK HERE for a 30 meg movie clip. The island is well known for being the source of granite used in the making of curling stones. Stone from the island is still used in the production at Kay's factory in Mauchline.